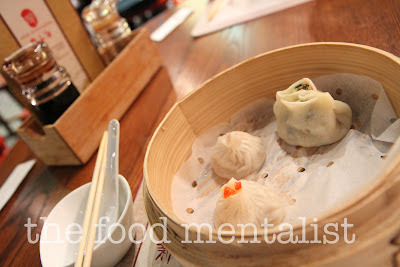 It's raining outside and Pete and I are heading to Chatswood this evening to sample New Shanghai's Dumpling Degustation. A steal at only $69 per person for six delicious courses with matching wines. Located in the Westfield shopping centre, I am pleased that we don't have to search for a park out in the rain, we simply drive in, park and are upstairs outside the restaurant all within a matter of minutes. Perfect. The first thing we notice about the restaurant apart from a large crowd waiting to be seated (a great sign!) 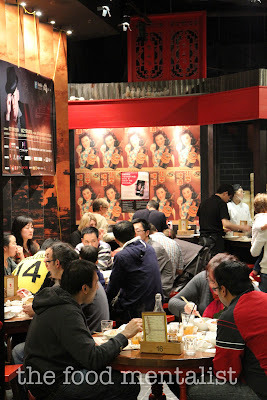 is that it's decor is very different to it's sister restaurant in Ashfield which we frequent often to get our dumpling fix. 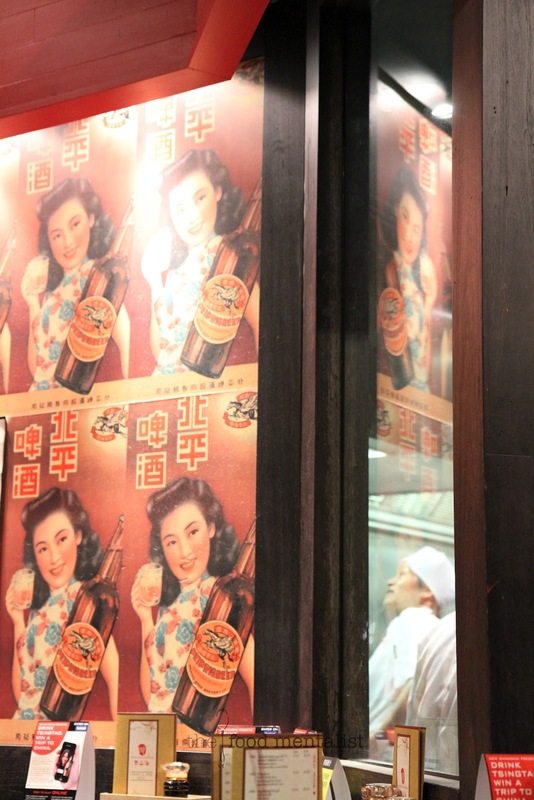 It is reminiscent of old Shanghai, with dark and red tones and vintage style posters which add a sense of authenticity to the space. We are greeted by a waitress who confirms we will be sampling the dumpling degustation. Instantly, we are each presented with a paper placemat outlining the degustation, complete with the names of the matching wines and an allocated position for each glass.I pick up a drinks menu on our table and am impressed by the tea menu which is extensive, many of which are visible on display above the bar area and I am quick to point them out to Pete. Have I mentioned I love my teas? 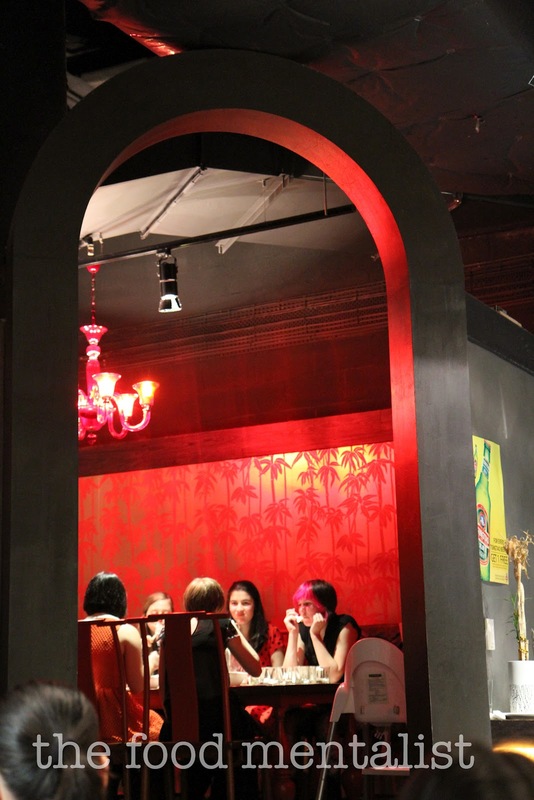 There is a private dining room in the back corner which looks cosy and a group of young friends appear to be celebrating a birthday. Our first glass of wine arrives and it is the 2011 Leo Buring Claire Valley Riesling, it is very floral and has a hint of citrus zest. I like that it is clean and fresh and the perfect wine to start the evening with. 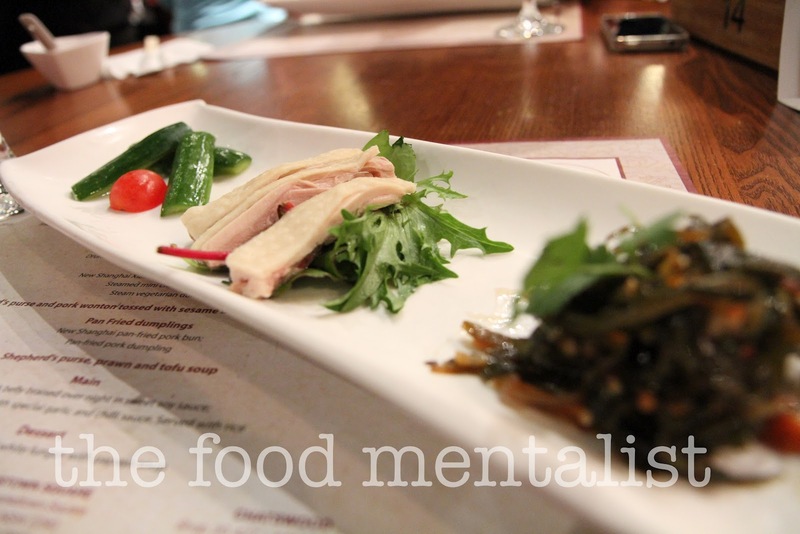 It is matched with a mixed platter of shredded kelp, chopped pickled cucumber and drunken chicken. 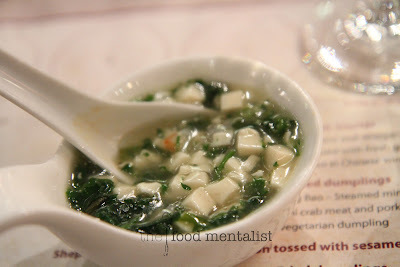 The kelp is SO good and is mixed with a chilli and vinegar style dressing, the texture is fantastic. Both Pete and I love it. Next to this is the drunken chicken which tastes fresh and tender, having been soaked in Chinese wine, herbs and spice. The cucumber looks simple but is crisp and sweet with a hint of garlic. 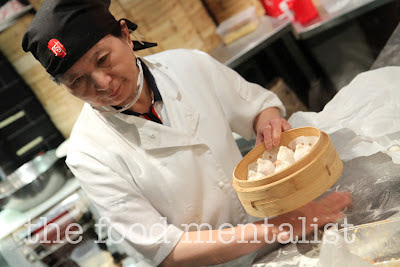 One of the chefs works tirelessly churning out baskets of steamed dumplings as we watch in awe at her skill and efficiency. 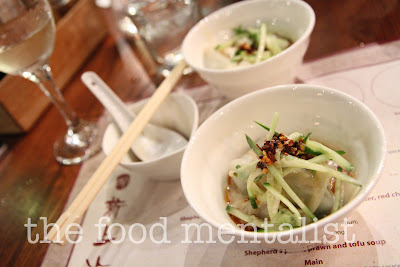 The next course is a trio of mixed steamed dumplings and it is matched with the 2010 Angel Cove Sauvignon Blanc from the Marlborough region in New Zealand. It is crisp, and typical of a good Sauv Blanc from this region and works well with the delicate flavours of the steamed dumplings. The first dumpling I choose is the steamed mini crab meat and pork dumpling - it is filled with a delicious combination of crab and pork and the dumpling skin is delicate and perfectly light. Next, I try the steamed vegetarian dumpling which is piping hot and packed with a mixture of Chinese greens and a other vegetables. It too is nice and I add a little brown vinegar to it which I gives it a little added kick. Saving the best til last, the New Shanghai steamed mini pork bun is hot, soupy and filled with a juicy morsel of pork mince- perfectly seasoned and delicious. I look over to Pete's basket in the hope I can snare his but it's too late - it's long gone. The next dish to arrive happens to be the highlight of the evening thus far, the Shepherds purse and pork wonton tossed with sesame butter, red chilli oil and spice. 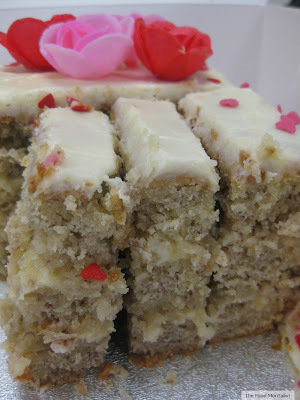 It is absolutely divine! And I am not exaggerating. 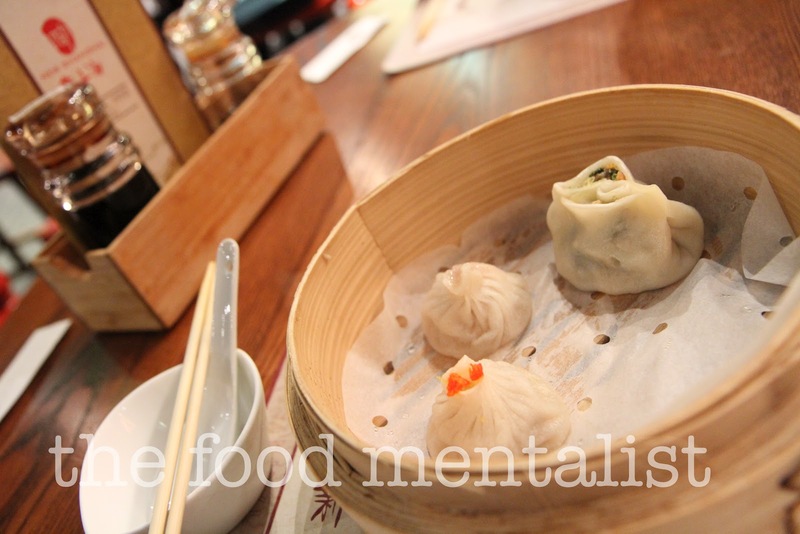 The combination of flavours works perfectly well and the sesame butter and red chilli oil meld together with the pork wontons to create a true delight. Pete is equally impressed. This dish is matched with the 2010 Cape Schanck Mornington Peninsula Pinot Grigio which maintains a good strength of flavour, with hints of pear and a dry finish. A welcomed match for the flavours of the accompanying dish. 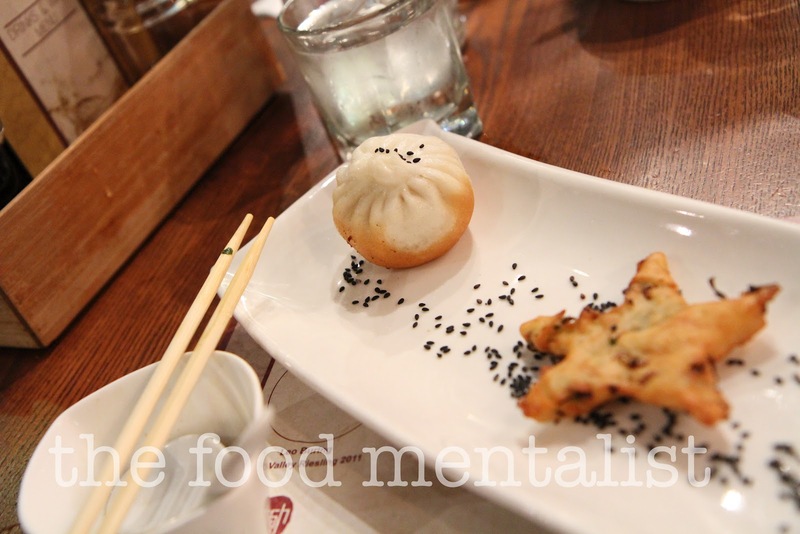 The pan dumplings arrive and amongst them is a star shaped shallot pancake, a crescent shaped pan-fried pork dumpling and the famous New Shanghai pan-fried pork bun complete with soupy goodness. I am literally addicted to these and order them every time we visit. 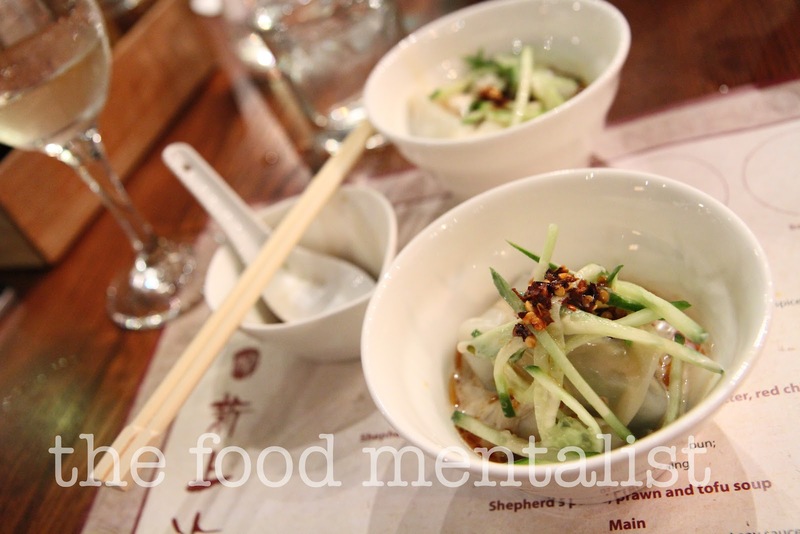 These dumplings are matched with a glass of 2010 Fifth Leg Crisp Chardonnay - a rich fruity flavoured white with a decent amount of citrus acidity. The Shepherds purse, prawn and tofu soup is next and it is super hot and provides a nice transition to our mains. The soup is redolent with chunks of prawn meat and the tofu and shepherds purse flavours are subtle. The soup is matched with a glass of 2010 Squealing Pig Otago Pinot Noir, which is light on the palate and has a good amount of spice, finishing dry. We both love our pinot's and are happy with this selection. 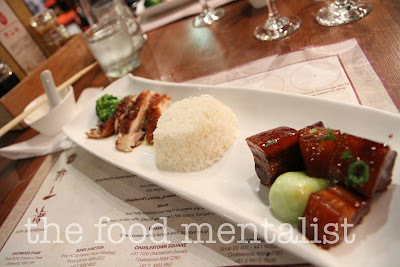 Our mains arrive and I am happy to see large pieces of juicy pork belly dripping in sticky sweet soy at one end of the platter. In the middle is a hot mound of steamed rice and at the other end, crispy skinned chicken which has been cooked in a special garlic and chilli sauce. The pork pieces are plump and tender and the sticky sauce is incredibly moreish, perhaps the result of having been marinated overnight in the caramelised sauce. It is my favourite of the two mains. 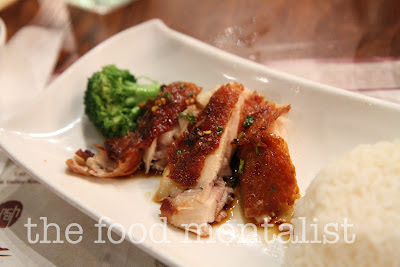 The chicken is equally delicious and reminds me of a Saigon chicken dish Pete loves. The chicken is fragrant and I can taste star anise. Our mains are paired with a glass of the 2010 Penfolds Koonunga Hill Shiraz Cabernet which is a good standard red, it has good fruit flavours and is very fresh for a red. It pairs well with the flavours of the pork and chicken. 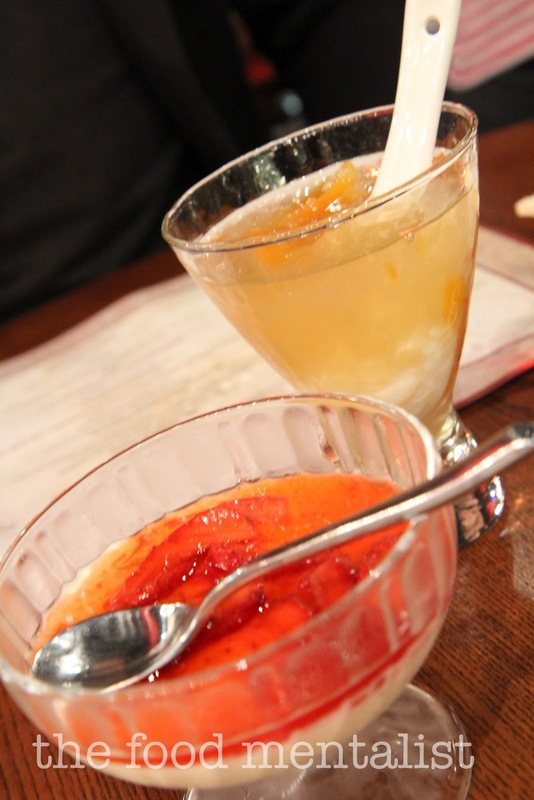 Our waitress informs us that in addition to the dessert on the menu they also have a strawberry pudding dessert on offer this evening and asks which one we would prefer. Pete decides to stick with the original choice and I opt for the strawberry pudding. Pete's dessert is the slow cooked white fungus with papaya soup - it is quite sweet and we both really like the texture of the fungus. We both really enjoy Asian desserts but can imagine that this style of dessert would be too unique for some. It's definitely worth a try though. The strawberry dessert is similar to a panna cotta topped with a lovely strawberry coulis and pieces of fresh strawberry on top. A delicious finish to our dumpling degustation. Service is friendly and very efficient throughout the course of the evening and we leave extremely satisfied and impressed by our dining experience. We schedule our return visit for a few weeks time. Tell me, have you dined at New Shanghai? What is your favourite dish? 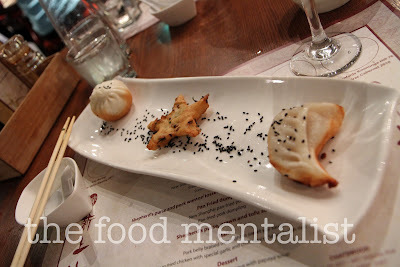 and does the dumpling degustation appeal to you? Sounds and looks delicious :) that pork in sweet soy looks so tasty but I think the dumplings is what I want! It all looks so good! Love dumplings and don't know if I could have resisted eating all I could hold. Looks like you guys got a great night out! There's a New Shanghai at Bondi Junction as well and I live about a 10 minute walk away. We might have to give this a go soon! omg i love panfried dumplings. crispy bottoms.... hello!